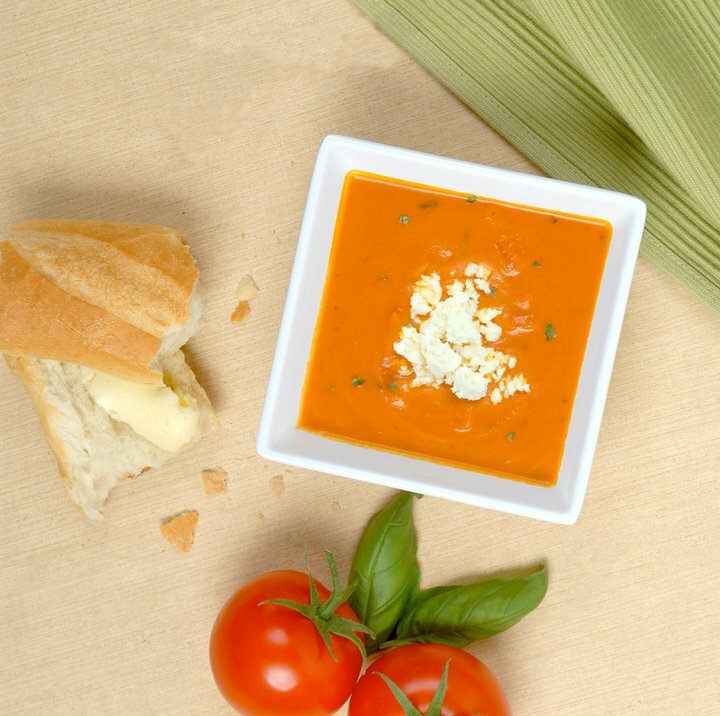 Tomato Basil Soup – a classic. Any season is soup season. Winter is when soup comes to mind most often. Spring and fall often require a good jolt of comforting warmth from soup. Soup can be a great light summer time meal. When the soup is good, it’s good anytime. Featured Soup Tomato Basil Our summer soup highlights two of the champion flavors of summer- sun ripened tomatoes and basil. Every day we have a vegetarian option or two or three. We always serve our popular chunky baked potato soup and broccoli cheese soup. Our tomato basil was requested so often, we conceded to customer demand and now serve it daily. We always have beef or chicken chili on the stove and usually one or more daily soups. Click below to see the full line up of soups. Soup is a good meal all alone with some bread. Put it in a bread bowl and a hearty loaf of soup will keep you going on a cold day. Pair a bowl of soup with any half sandwich, panini, or salad and get the best of both. Need a little extra today, add a cup of soup to your sandwich or salad. Of course if you want to bring back memories of your childhood go with a grilled cheese and tomato soup. Soup is available in individual servings – cup, bowl, or loaf, quarts for dinner, and group style for catered meals. Ask one of our catering experts about including soup in your next event. Call (256)922-2253.